Come on by our practice on 23 January 2017 from 3-7pm for our FREE Invisalign Open Night! Meet our Specialist Orthodontist Dr. O’Donnell for an in-depth examination and treatment diagnosis. You will also receive a 3D simulation of your new smile and learn about the innovative clear brace system and how it can improve your smile and confidence. We will also go over your treatment quote and our payment plans. Book in or walk in! 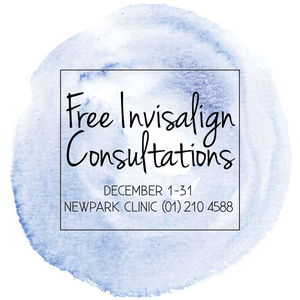 During the month of December we are giving FREE Invisalign consultations (normally €50)! Invisalign clear braces are removable and virtually invisible, adapting to the modern person’s lifestyle. Dr. O’Donnell is one of three Specialist Orthodontist Diamond providers in the country, delivering unparalleled invisible brace treatments! Invisalign straightens teeth by using a series of clear, plastic aligners that are custom-made specifically for your teeth. You will progress through each aligner every two weeks to gradually move teeth over time.